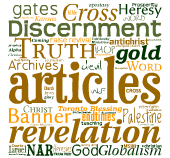 In a previous issue of PLUMBLINE, I described the efforts of C. Peter Wagner to create a New Apostolic Reformation (NAR) which he predicts will be even greater in scope and significance than the Protestant Reformation of the 1500's. The centerpiece of the movement is the purported restoration, by God, of the NT office-gift of "Apostle' to the end-time church. Now Wagner and his apostolic buddies are attempting to move from vision to reality. In an article titled, APOSTOLIC REFORMATION on his Website Global Harvest Ministries he reveals moves that are currently underway, to implement his apostolic reformation. In this article he restates the goals and also the preliminary means to implement them. Wagner asserts: NAR is an extra-ordinary work of God at the close of the 20th century that to a significant extent is changing the shape of Protestant Christianity around the world. For almost 500 years Christian churches have largely functioned with traditional denominational structures of one kind or another. Within this reformation, Wagner sees a growing recognition of present day apostolic ministries who are giving birth to their own family of leaders and churches to whom they have a relational commitment. Within New Apostolic Christianity, this governmental authority is being exercised in the local church by the pastor and on a translocal level by apostles who operate with a relational authority. Wagner sees what is happening in the NAR as key to world harvest. Wagner sees apostles as being at the peak of their (own) networks and the people in their networks as accountable to them. It is here in the article that the accountability of the apostles is addressed and Wagner begins to refer to the means of implementing the apostolic structure. Wagner is personally involved in an accountability structure called the "New Apostolic Roundtable." Twenty-five apostles were invited to join as members and they plan to meet together annually, the week after Easter. Eventually, the names of the roundtable will be made public. Because this movement is growing so rapidly around the world, Wagner also sees a need for a larger kind of structure. As a result he and a number of others have formed what they call the International Coalition of Apostles. They have sent out their first invitations in January of this year (2001) and have just passed one hundred and fifty members. Wagner expects that they will ultimately attract from five hundred to one thousand members (solicited by invitation only). They plan to hold an annual meeting along with occasional regional summits across America and around the world. In Wagner's new book, APOSTLES OF THE CITY: HOW TO MOBILIZE THE TERRITORIAL APOSTLES FOR CITY TRANSFORMATION, he attempts to describe what the local role of these apostles might be. He defines Apostles to the City as those "whom the Holy Spirit gives an anointing for extraordinary authority in spiritual matters over the other Christian leaders in the same city." While not excluding others, Wagner hypothesizes that the most extensive pool for identifying apostles of the city is among the mega churches. Wagner notes that extra-denominational alignments are already occurring, which provide the ideal structure for recognizing the Apostles in the city. He sees it highly probable that we will begin to see the development of spontaneous territorial spheres which will rise to a higher importance than traditional denominational affiliations. When asked what he thought the main stumbling block would be, that would keep leaders from embracing the Apostolic Reformation, Wagner cites "a commitment to tradition amongst ministers." Wagner states: "I think that some are bound by religious forms and functions that are ineffective and I think in many cases it is demonic influence." Pastors: are you ready to be placed under certain translocal apostles who are identified by other translocal apostles? I think I feel a college of Cardinal/Apostles coming on. Church Members: are you ready to implement what these apostles pass on to you, via you pastor? District Superintendents: are you ready to move over for a newly appointed apostle? I am sure many of you tire of denominational Christianity with its penchant for politics and power and parochialism but are these new apostles immune from these very forces? Are they somehow unaffected by the same fleshly forces that create some of the undesirable features of denominationalism? Does not the NAR smack of an attempt to replace one power structure with another? We already have a denomination called the Apostolic Church. I noticed that the new apostles are to be recognized by "invitation only." Is not this already a sort of insider 'good ole boys club' in the making? I wonder if they have been free of politics even to this point. There will, of course, have to be a "preeminent" or "leading" apostle. How will he be recognized? It amazes me that virtually no one is challenging Wagner and his apostle buddies. Perhaps you have not known about it or perhaps you don't take it seriously, assuming it will just go away. The Apostles will not just go away and one day they will possibly arrive in your area. Will you accept them or will you respectfully challenge this NAR on Biblical grounds? Today we often refer to some people as apostles, when speaking of an effective church planter (for example, William Carey was an apostle to India). In this sense, we all agree that there are still missionary apostles with us today. The NT also refers to this broad use of the term "apostle." In this instance, 'apostle' simply means 'messenger' or 'one sent' on a specific mission (John 13;16; 11 Cor. 8:3; Phil. 2:25). 1. NT apostles were required to be eyewitnesses of the resurrected Jesus. Paul says: "After He was seen by James and then by all the apostles, then last of all he was seen by me also as one "born out of due time." (I Cor. 15:7,8 NKJV) Christ had ascended before Paul was converted but through a miraculous appearance Christ revealed himself to Paul. Last of all the apostles, Paul saw the risen Jesus. "Last of all" can only be an adverb describing something that is last in a series (this is especially true when there is a serial presentation, such as then ... then). Paul is thus the 'last of all' apostles. Those who assert that God has restored this office of apostle to the endtime church will have the apostle Paul to contend with. Paul repeatedly asserts that his apostleship was by direct divine appointment (Rom. 1: 1; Gal. 1: 1). Who were these foundational Apostles? First there were the initial twelve with Matthias replacing Judas. So important are these charter members that we read that their names will be inscribed on the foundations of the heavenly Jerusalem (Rev. 21:14). Second, there apparently were a very few more who had also seen Jesus and been commissioned by Him. Acts 14:14 calls both Barnabus and Paul apostles. James the brother of Jesus is called an apostle in Galations 1:19. Andronicus and Judas were called apostles in Romans 16:7. Wayne Grudem, a sometimes ally to current prophetic utterances, however, is absolutely convinced that there are no NT apostles today. He states: "Since no one today can meet the qualifications of having seen the risen Christ with his own eyes, there are no apostles today. In place of living apostles present in the church to teach and govern it, we have instead the writings of the apostles in the books of the NT. Those NT scriptures fulfill for the church today the absolutely authoritative teaching and governing functions which were fulfilled by the apostles themselves during the early years of the church." (Grudem, The Gift of Prophecy in the NT and Today, p. 276). Orrel Steinkamp is publisher of The Plumbline newsletter and director of Plumbline Ministries. He has served as a missionary to Viet Nam, Professor and pastor in Australia, as well as America. Most recently he has retired from the pastorate to pursue Plumbline Ministries fall time. (He received his M.Div and Dr. of Ministry degrees from Bethel Seminary).